How can I add my own fields to the calendar? Note: Field mapping is a bit different in Salesforce and FileMaker - and they're no mapping to be done in Google and Basecamp since you can't alter the default fields there. 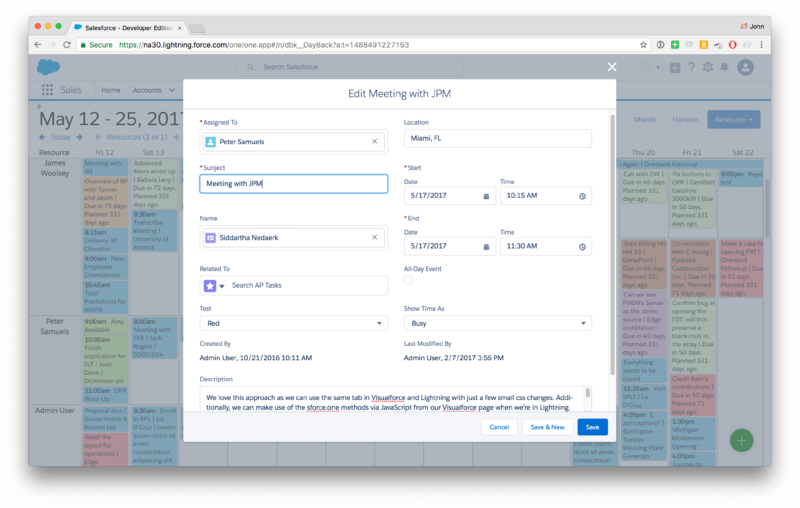 Read about field mapping in Salesforce or in FileMaker . When asking about your object's fields, DayBack makes a distinction between the "title" and the "editable title". The editable title is mapped to a single field in your object (the "Subject" of a case or the "Name" of a task, for example). But the title can be mapped to more than one field where additional fields are separated by comas. You might start with the Task Name, then include the contact's phone number for whatever else you'd like to see about the event before you click on it. Any fields you include will be added to the display. The separator between values is currently a pipe "|". You can change that by editing the "Return character substitution" value in Admin Settings / Event Styles. When you click on an event in the calendar, the fields you see there are determined by the other fields you've mapped in Settings / Calendar Sources. Status: this is the field by which we color code your events. Now this may not be a "status", it could be a division with your company, or a process, but color coding by some field is cool. You can change the word "status" in the calendar's display by editing DayBack's translation settings. Resource: this is the field that becomes a column on the calendar's "Resource" view. Again, resources may be sales people, trucks, or barbershop chairs. If you have a resource that folks compete for in your business, this is where you map that. This is a very powerful way to look at your items (and to make sense of a dense calendar) so read up on resources here. Include as many additional fields as you need on a drawer beside the item detail popover by configuring "Additional Fields" when setting up your sources. Details are here: Additional Fields. You can include custom fields when you define your calendar sources. Just remember that Salesforce gives your custom field a suffix so if you have a custom field called "Sample", for example, the field's name in Salesforce is "Sample__c" (without the quotes). If you have way too many fields to show up in the DayBack popover shown above you can access more fields on our own Salesforce layouts. One way to do this is to include a custom action (a button) that takes you to your record in its own layout. DayBack comes with one of these "Go to Event' buttons in the "Events" source: you can just copy the code for that button and use it on any object you're seeing in DayBack. You can include as many fields in the title as you'd like (and include as many additional fields as you need), just know that the "deeper" DayBack goes across your FileMaker relationships, the slower the calendar will be at retrieving this data from FileMaker Server. So if you only use fields from your events table, it will be pretty fast. If you include related fields it will slow down slightly but related fields are so useful everyone uses them (the contact's phone number in our example is a related field). If you include summary fields or summary calcs it can really slow down. If you have a ton of event fields (like many small medical practices do), you may want to use your own FileMaker layout instead of the event popover in DayBack. DayBack is running in a browser, so you can't just ask it to use a FileMaker layout, but you can create custom actions that open an event in FileMaker Pro, Go, or WebDirect depending on the kind of URL you enter. More here: Custom Actions.